I have a somewhat reliable system for rating books over on Goodreads. If I really hated it, I give it one star. If it was okay, I give it two stars. If I really liked the book, it probably got three stars. If I loved it, stayed up all night reading it and couldn't put it down, it most likely got four. I save my five star ratings for those books that I not only love, read all night and couldn't put down, but also changed me somehow. These are the books that stay with me long after I have read them, and cause me to rethink the way I am living my life. Simply put, I only give five stars to a book that has made me a better person because I have read it. 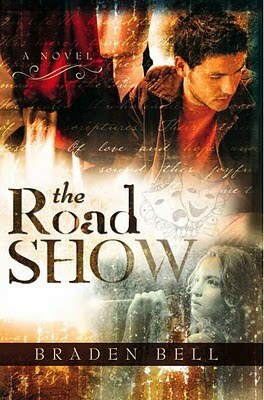 The Road Show by Braden Bell is one of those books. Now, if you were going to judge this book by its title only, you might think it is along the comedic lines of the crazy LDS movies that are out there, like The Singles Ward or The Home Teachers, because road shows are supposed to be hilarious. But you'd be completely wrong. Not many books hit as close to home for me as this one did. But of course, because of our universal struggles with weakness and sin and our absolute need for the Savior, I think this book will probably hit every reader just as closely to home as it did me. The book centers around 5 characters who are each dealing with their own individual struggles. Sin, addiction, depression, health problems, loneliness, and pride are all represented. I related very well to these characters, because I know them. They are my family. They are my friends. They are my neighbors. They are me. As each of these characters comes together to participate in the ward road show, the assigned theme of "Our Savior's Love" becomes more than just the expected, stereotypical, cheesy performance. They each discover the healing power of the atonement, and as I read, I rediscovered the same healing power. Although each character's story seems to be tied in a lovely little bow at the end, I feel that it is important to note that that is exactly what the Atonement is capable of doing. He takes all of our sin and weakness and misery and he makes it better. We only have to believe, and come unto Him. It is not trite--it is true. I have not stopped thinking about this book since I read it. It affected me greatly, and because of it, I am re-evaluating the struggles I face in my life and my own relationship with the Savior. I know that I have many blog readers who are not LDS, but are of other Christian faiths. Even though the characters in this book are definitely Mormon, the message is universal. Jesus Christ took upon Himself our sins, our weakness, our infirmities, and our fears and He heals us. I cannot urge you enough to go out and pick up this book. It's available on Amazon, and as of yesterday should be in stores like Deseret Book and Seagull. If you would like to read the first few chapters, Braden has posted them on his website. (Click here for sample chapters). I'm warning you though, if you read those first four chapters, you will be hooked. Lara, I'm Braden's sister. I loved your review so much. I enjoyed reading through a few of your posts and my heart goes out to you and your family. We've been in the unemployed and underemployed situation before and it's definitely one of those soul stretching experiences. Your tender mercies you recorded were just beautiful, it's always amazing to me how the Lord can find that perfect balance of blessing us while also trying us. You have an amazing voice! thanks for the book review. i need a good book to read. looking forward to trying to pick this one up. i love your rating system by the way! i always love a good book like this that stays with you after you have closed it. sounds like I need to add another book to my to-read shelf. I've been hearing a lot about this book via the blogging world. I'm glad to hear it's so good! Most LDS literature, I can not stand, but when it's good it can be really good. I think I'll check this one out! Thanks for the recommendation Lara. I'm always looking for a new good book to read! Sounds like a great one! Thanks for the review. Wow girl, your review was awesome! I love the way you made it so personal. Sounds like you have an ideal review system. You would be a great person to be connected to on goodreads. I have to admit that this is a title I probably would have passed over for the very reasons you listed. I am now intrigued by your very personal review and look forward to picking it up! Thanks for the recommendation. I need a good book! Thank you so much for your review! This is very generous and you absolutely made my night. I am thrilled that the book effected you like this and am honored that you wrote about it. P.S. I meant to especially thank you for noting that the ending is true not trite. I thought a lot about that and went back and forth whether or not to do it--but felt that it was important to portray the possibility of comprehensive and completed healing through the Atonement. I have to read this book! This was the third or so review I read of it this week and they have all been positive! With each review, I get more and more intrigued with this book!